Climate change – off in the ozone | Watts Up With That? As anyone knows, four years does not a climatic trend make, and I could not find anything else that might be relevant. But there is a proxy for thunderstorms; tornadoes. Without strong thunderstorms, tornadoes don’t happen. Sooo, I think the leaps of logic in this paper are Olympic class ones. For decades, scientists have known that the effects of global climate change could have a potentially devastating impact across the globe, but Harvard researchers say there is now evidence that it may also have a dramatic impact on public health. Unfortunately, Anderson said, we don’t know how this process will evolve over time. “We don’t know what the development of this has been – we don’t have measurements of this deep convective injection of water into the stratosphere that go back in time,” Anderson said. While it’s impossible to know how many skin cancer cases may be related to ozone depletion over the U.S., the link between ozone loss and increased incidence of the disease has been extensively studied, Anderson said. Many crops, particularly staple crops grown for human consumption – such as wheat, soybeans and corn – could suffer damage to their DNA, Anderson said. Though they had worked since the mid-1980s to investigate ozone depletion in the Arctic and Antarctic, by the early-2000s, Anderson’s team had turned their attention to climate studies. In particular, they were working to understand how the convective clouds – updrafts that cause storms to build high into the sky – contribute to the creation of cirrus clouds. “It was in the process of looking at that mechanism that we came to this unexpected observation – that the convective clouds in these storm systems over the U.S. are reaching far deeper into the stratosphere that we ever expected,” Anderson said. While earlier tests performed in the Arctic had demonstrated that water vapor was a key component in creating the “free-radical” compounds that break down ozone, Anderson said the latest finding is much more troubling, because it suggests the process can happen at much higher temperatures than initially suspected. “We have hundreds of measurements world-wide addressing the photochemical structure controlling ozone, but only a limited number of flights over the U.S. in summer,” he said. “The flights were studying average storms over the middle-west, and of the 20 observations we made over the U.S., about half demonstrated significant penetration into the stratosphere,” he said. The next step in the research, Anderson said, is to conduct a series of tests to confirm whether the free-radical form of chlorine and bromine are present in the stratosphere at significantly elevated levels in the presence of convectively-injected water vapor. Strong summer storms that pump water high into the upper atmosphere pose a threat to the protective ozone layer over the United States, researchers said on Thursday, adding that the risk of damage may increase as the climate warms. Is it me or a lot of these papers full of coulds and maybes followed by a ‘more research is necessary’? If your initial research was so poorly constructed why should we give you any more of our money? Radiate forcing gives increased thunderstorms. Would that be an acknowledgement of negative feedback by any chance? Interesting, the host’s take on this. Anthony introduces with a minimum of analysis, then prints the piece and allows it to fall flat on its face. I read the whole thing and didn’t see a single thing that would cause me to feel fear, certainly nothing that would prevent from leaving the house (my vehicle ceasing to run is my greatest fear there). All I saw was the typical “woulda/maybe/coulda” that we always see in these kinds of pronouncements. Endless invention. Artistic creativity these days resides in “climate science”. Expressionism, impressionism, pointillism, it all runs together nowadays. What a show. I would think that widespread vitamin D deficiency is the root cause but it’s going to take 20-40 years for them to admit it like everything else. Correct me if I’m wrong, but isn’t the ozone layer significantly higher than the highest thunderstorm (100+ miles vs. 10 miles)? Don’t see any correlation or measureable interaction between the two. Is this another attempt to ban CFC’s? What were these guys smoking, and how can I get some? It must be officially called “global climate change” now. Their behaving like a company of cowboy builders, every time they’re work is shown to be of poor standard and not fit for purpose they change the name of their company and continue with the same terrible quality of work. Of course, most of the ozone depeletion occurs in early spring, so all those ozone-depletion-induced cancers will have to occur in tropical climates….oh wait. Seriously, WHAT IS THE MATTER WITH THESE PEOPLE? They’re smart, right? Okay, okay, I can hear some chortling over there in the corner, but these really are intelligent people pushing non-intelligent claims. You’d think they’d twig that the whole CAGW claim is seriously crumbling and when it collapses it will have serious earth-shattering repercussions for all those still clinging to the scam. Switching sides earlier would be smarter than leaving it to the last minute and showing themselves as late bloomers, or worse, being too late and wearing political and criminal egg on their face for the rest of their lives. Gee, I suppose if they hang in there for that extra dollar, it’ll help with their defense trials. Don’t leave it too long, CAGW guys and gals, have your bags packed and be ready to jump across with your “We knew all along it was a scam” lines. Sheesh! What they’re saying is it’s still our fault. It isn’t our CFC.s that did it, though, it is our air conditioned SUVs and Big Oil life style. They never tire of that meme. Have they included in their analysis any studies on how many people are more active outside than in the past? At my age, I do things outside that my parents never dreamed of doing at the same age. And wasn’t there a study about 1-2 months ago about sunscreen causing sun cancer, I only heard it did not read it. Don’t large scale storms produce high voltage discharges that create ozone? They always focus on the negative. Its hard to sell research without a healthy dose of doom. The tornado data simply demolishes this. More “pal review” at Science. Had I been sent the paper for review that would have been my first comment–and probably just about anyone else with a smidgen of skepticism would have done the same. You can bet that Science chose their reviewers to avoid this. I wish you wouldn’t include these ridiculous articles, it literally gets me ill. These people are like malevalent children. And they’re everywhere. There’s no hope. I just get sick to my stomach. But thanks so much for what you do. I am surprised at this resurrection of the nonsensical claim that significant increase to UV at the surface would result from depletion of the stratospheric ozone layer. This claim was a popular scare a decade ago until it was debunked. Indeed, back then Greenpeace claimed that sheep in Argentina were being blinded by exposure to enhanced UV as a result of the Antarctic ozone hole: in fact the sheep were being blinded by sharp grass piercing their eyes. Ozone exists all the way from the stratosphere down to the surface. Deplete the ozone in the stratospheric layer and UV absorbtion would increase at lower altitudes so negligible difference to UV flux at the surface would occur. An attempt to start a health scare on the basis of possible stratospheric ozone depletion is as daft as the attempts to start scares about possible ocean acidification, possible peak oil, and possible fairies at the bottom of my garden. And thus, far deeper into the stratosphere than the current models account for. How much of the radiative forcing assumed for CO2 is countered by this negative convection feedback? It’s based on Kerry Emmanuel’s (note he is one of the authors) crackpot theory that a mass extinction was caused by a “supercane” enhanced by something that raised the sea surface temperatures, transported water vapor into the stratosphere, and depleted the Ozone layer, and the UV exposure killed almost everything. I saw him spewing this bizarre convoluted theory on the either the Discovery Channel or The History Channel a few years ago (probably the History Channel, fits in really well with their regular bits about Nazi-Space Alien Technology (As a crackpot theory! Not calling anyone a Nazi!) or stuff like that). He was the “expert” they brought in to offer this wild-eyed theory. So now he is applying this craziness to the present? Holy Crap! … And wasn’t there a study about 1-2 months ago about sunscreen causing sun cancer, I only heard it did not read it. I just make sure I introduce myself to the sun gradually to get a decent tan in the spring and use long pants, a long sleeve shirt and a hat otherwise. (The southerners think I am nuts but I do not get sunburn or bug bites) I also make sure I get enough sun that I do not have to worry about Vit D3 but that is no real problem on a farm in the south. You would think people would have a bit more common sense. I seem to recall that all this ozone stuff started with the ‘hole’ over the Antarctic? No recognition of the fact that the size fluctuated with the season, and the presence of a huge CFC generator – Mt Erebus. I once made a device that was intended to be a negative ion generator, but it went a bit wrong and was apparently generating ozone. They can have that if they like. Since the human increment to CO2 is not causing any substantial amount of warming, there is no concern that human behavior presents any significant risk by this mechanism, even if it isn’t a total crock. Coauthor Kerry Emanuel is a pretty good indicator for poor science. 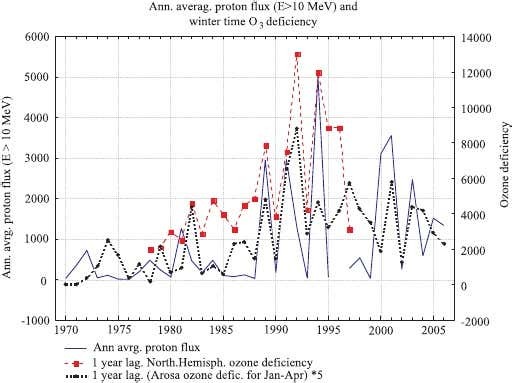 This Letter reports reliable satellite data in the period of 1980–2007 covering two full 11-yr cosmic ray (CR) cycles, clearly showing the correlation between CRs and ozone depletion, especially the polar ozone loss (hole) over Antarctica. The results provide strong evidence of the physical mechanism that the CRdriven electron-induced reaction of halogenated molecules plays the dominant role in causing the ozone hole. Moreover, this mechanism predicts one of the severest ozone losses in 2008–2009 and probably another large hole around 2019–2020, according to the 11-yr CR cycle. Of course they do………….more funding please. The climate ALWAYS changes so what? When are they going to leave this scam alone? Grrrrrrr. In my lifetimeI have survived certain death from the next ice age (that never happened), ozone depletion (never happened), acid rain (never happened), toxic rain (escaped that one too), starvation by over population (opposite, I’m overweight), and global warming. History repeats itself, but it looks like the various dooms day scenarios have differing periodicities. Ozone’s turn right now. What I find most hilarious about studies like this is that they go to extraordinary lengths to equate some cause with some effect, but they don\t bother to measure and report on the effect! One would think that having postulated an effect resulting in a change in UV at earth surface, the first thing to do would be to check UV readings at the surface. Obviously they didn’t do that, which suggests atroscious science or they did do that and ignored it which suggests…. the hidey hole will grab this comment if I put in the most appropriate word…. … and potentially higher rates of skin cancer. One of the things that I have always liked about electrically violent storms was the nice aroma of the ozone that they generate. One other source of ozone is ultraviolet light in certain bandwidths modifying ordinary oxygen into ozone. Of course, it is probably just a coincidence that the ozone holes appear just when the tilt of the earth’s axis minimizes the ultraviolet light from the sun to those areas. I find it interesting that when I turn on certain UV lights, the ozone is noticeable within seconds, but I have never found a paper that addresses how fast our ozone layer could be regenerated by our sun. Put in the form of a question: “If I were standing with the sun directly above me on a clear day and all of the ozone shielding me was changed to ordinary oxygen by magic, how many minutes would it take for the sun to replace 63% of that ozone?”. I’d like to hear Leif’s quick summary on this paper. Although Harvards suggestions may sound a little dodgy.. I remember reading the original Ozone hole report in the old style Sci-Am written by the `Woods Hole` team and specifically remember, but cant find the article now, a statement towards the end of the report saying the rate of ozone change over such large areas of atmosphere was too large/too fast to be accounted for/caused by dispersion/ mixing rates of gases, including CFC type gases. They’re obviously going after Willis and his natural thermostat theory! Thanks for the link and I stand corrected: ozone layer is about 15 miles and highest thunder tops is slightly over 10 miles. Having flown often, I have noticed that outside temps at 35,000 feet are typically -56F (-48C). Yet according to this chart, ambient temps actually increase from this altitude as you climb to 135,000 feet. This is counter intuitive as the air density continues to decrease and the solar warming should be less. Using the Ideal Gas Law (PV=nrT), I would expect the ambient temps to continuously decrease until we reach the lowest temp at the boundary of the atmosphere and space. The space station, orbiting about 100 miles (~520,000 ft) has an outside temp near absolute zero or about -270 C. Why do ambient temps increase above 35,000 feet? If you want to read something scary, go to the New York Times article, it’s linked off the Drudge Report, and scroll down to the comments following the article. The folks commenting are the craziest bunch of wild-eyed astrology types that are imaginable. I’m sure that most of them believe in UFOs, the Mayan calendar and Bat Man superheros. No wonder the Times is going down the tube. Hasn’t Jo Haigh and others found that ozone appears to increase above 45km when the sun is less active with the implication that it decreases above 45km when the sun is active ? That would suggest that the cause of increasing and decreasing ozone is solar but the effect on the stratospheric temperatures would then have the reverse sign of that previously expected if the dominant process is the one above 45km (as compared to the process below 45km). Thus would an active sun reduce ozone and cool the stratosphere whilst an inactive sun would increase ozone and warm the stratosphere. That would also detach ozone variations from CFCs AND thunderstorm activity which could only affect the region below 45km. Why do ambient temps increase above 35,000 feet? Bill, don’t know about 35K feet being the border, but the tempeature increase in the stratosphere is generally attributed to absorption of UV radiation by stratospheric ozone. Massive fishes & birds committee suicide reported worldwide because the environment has changed that they can’t continue living in it. Hope human can wake up fast and make a correction in time to stop this man-made catastrophe. .
UN has launched the warning in 2006. If you want to help yourself and others, reform 2012 Farm Bill. Make peace starting from our plates. That’s such a shame – I was trying to play their role but couldn’t avoid the cynical overtone yet still managed to convey both fact and humor – or so I thought it was a bit funny. Has Kerry Emmanuel been restrained by accuracy, fact or truth in the past several years? I think the report which Emmanuel edited gives some good insights to the answer to that question. These consensus promtoers and defenders are a laugh riot. Nerd, I think you are right. It will be funny when it is shown that smearing sunblock all over yourself causes cancer by preventing the sun from producing Vitamin D in your skin. Our earliest adaptation was black skin to protect us, not from cancer, but from too much Vitamin D. Of course we produced about 100,000 IU’s of Vitamin D from the sun then. If they’re sucking up water vapor then wouldn’t they also be sucking up smog (ozone)? Maybe we need to more smog to counteract the wv? “If you were to ask me where this fits into the spectrum of things I worry about, right now it’s at the top of the list,” Anderson said. Then given the spectrum of all those very serious worries “the rich” have apparently visited upon us according to similar ground breaking research from the Obama Campaign, this must be Mitt or Ann Romney’s fault too, eh? Note changepoints ~1945 & ~1976 (simple reason why conventional investigations of vorticity went off the rails into a fog of controversy for more than a generation). 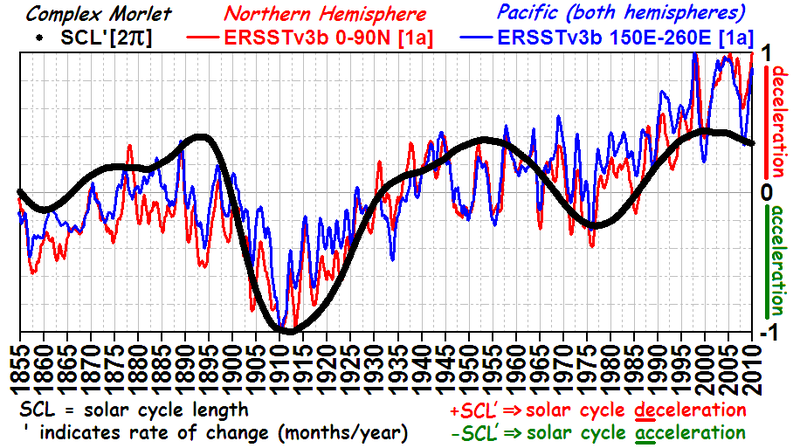 With such clear patterns, I’m left wondering why Dr. Curry calls the climate “problem” “wicked”. Layered simplicity seen through a focused lens by someone willing to acknowledge nature’s beauty is neither “wicked” nor “problematic” (unless one’s game is ignorant &/or deceptive extremist politics of one stripe or another, as is the case for a substantial number of climate discussion participants). As you can see from a quick inspection of the “Total-Ozone-Solar-QBO” graph ( http://i45.tinypic.com/bfxn4.png ), the variance can be further partitioned. The secular component, the annual envelope, & semi-annual envelope are nonrandom. I’ll be more specific after I’ve been properly funded. Supposing their hypothesis is correct – that the increased thunderstorms, increases the free radicals of Chlorine, Bromine, and other halogens and this leads to an increase in the rate of destruction of Ozone, which in turn would mean that more harmful UV radiation reaching the Earth’s surface – I can only surmise that life on Earth would never have been created, or that life was created precisely because of the lack of an Ozone layer. This is because during the period of time in prehistory when life was supposed to have been created there was more volcanic activity and more violent thunderstorms, which in turn, would create the halogen radicals required to destroy the Ozone layer, which in turn, would allow more harmful ionizing UV to reach the surface, which in turn, would destroy or cause the creation of the primary building blocks of life. Unfortunately this could never have happened, because there was no AGW at that time in prehistory. “The next step in the research, Anderson said, is to ” grab the research money before we’re all exposed as mass hysteric lunatics. Seriously, these guys have been preaching the same tune that they probably believe it themselves. Whatever does create the hole in the ozone layer, it is a good bet that it is not CFCs as the banning of these was a stalking-horse for the banning of CO2 by members of the same mob on equally shaky evidence that it was having a catastrophic effect on World Temperature. OK; so here’s a tailor-made reference point for all those who dispute that climastrologists have ever predicted “Catastrophic” AGW. So maybe DAGW (Devastating AGW) would be fairer? Whatever, I’m easy. Catastrophic vs. Devastating is a distinction without a difference. It must be officially called “global climate change” now. In case you’re actually impressed by Adams’ logic, the point where it fails is the finite fractionation of infinity. All fractions of infinity are also infinite. The ozone hole is a cycle , too. It gets bigger and smaller in relation to the seasons. The location is at the poles. The Antarctic one is bigger than the Arctic one. Why, go figure. Next they consider night and day also being caused by humans. First, please don’t misconstrue what I’m about to say, as I completely agree that this ‘latest research’ on might-maybe-coulda-possibly-but-we’ve-no-baseline-or-data sounds like completely – or nearly completely – bogus chicken little squawking. That said, to be fair I have to note that typically even the very best research will always end with “more research is needed.” This is true in any field and one would be nuts to not ‘go there.’ The thing is that with good solid research, the ‘more research is needed’ will actually make sense and be for something that clearly stands a good chance of furthering knowledge – not just producing more confirmation bias or grant money. A good scientist will draw on the work just done to suggest various directions one should go in the future in order to add to the state of knowledge. In other words, as irksome as the ‘more research is needed’ statement can seems, that in and of itself is not a negative reflection on the work already done. So rip this ‘ozone-thunderstorm’ paper to bits, but not because they say more research is needed, but because the base paper is flawed, and the ‘more research’ suggested is also poorly conceptualized. The ozone problems caused by refrigerants was invalid research. It was a jumped too conclusion by a BAS scientist. 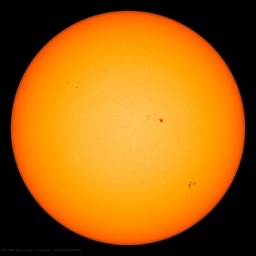 It has turned out to be associated with solar energy variations. How thunderstorms affect the ozone I cannot imagine since the ozone is way above the max. height of Cb cloud. I think this is partially correct. The main reason why UVb reduces cancer is that it is the only wavelength that triggers the production of melanin which protects the skin from a broad spectrum of UV wavelengths. UVa oxidises the melanin and turns the skin grey rather than brown it also damages the skin . High ozone levels increases the ratio of UVa to UVb and is a bad thing. Until recently sunscreen removed UVb but not UVa so this was also a bad thing. Although correlation does not prove causality the increaasse in skin cancer over the last 80 years is precisely correlated with the increased use of sunscreen. There is also some evidence that vitamin D helps to repair cell damage so you get a double wammy. The evidence contradicting the thesis in this paper is very strong. The greatest incidence of skin cancer globally is in Australia and New Zealand which have the HIGHEST level of ozone in the world. The lowest incidence of skin cancer occurs in people whose occupations expose them to the highest levels of direct sunlight (e.g farmers and roofers). Sun related melanomas are almost entirely suffered by white skinned races. Although dark skins can produce melanomas these are randomly distributed over the body (like soles of feet) and are thought to be genetic . I personally think that sunscreen is as big a scam as global warming. The evidence I have cited comes from research from a Caltech lecture I found on the internet about 5 years ago. When I tried to listen to it again the following week I typed in the same Google search but the there was no sign of it! Someone had paid to have it removed? One of the predictions that the professor made was that by 2008 all the media would be telling you about UVa . The reason? The pharmaceutical companies had known about the problem since about 2000 and had been rushing to get approval for new products which would remove UVa. Now if you Google melanoma you do get papers on the effect of UVa but if you look carefully you will see that a number of these refer to peer reviews going back to 2002. We were not told then because there was too much money at stake. Kind of interesting that . . . The holes form over the poles, where not many actual people live, in winter when the sun isn’t shining on the ground where these few people may be found. Hard to get more human skin cancer out of that I would think. I always believed that the original assertion that CFCs were responsible for the original ‘ozone hole’ was poor, unjustified science, probably incorrect, and an activist precursor for the big Climate Change scam. The key thing that made the Montreal Protocol work was the support of Dupont – the very first unholy alliance between activists and big business. Each gained – Dupont stopped competitors using a patented chemical which was about to lose protection…. This is clearly part of the master plan of Dr EVIL. We need to get Austin Powers on the case! Here is Dr Evils plan!! I thought lightning produced ozone. regarding vitamin D: one of its attributes is that it used in some cells, perhaps actually on, not in, to differentiate between our own body cells and foreign cells so the immune system can eliminate the foreigners. Sorry this is not technically more complete, I came across it while researching sarcoidosis granulomous. It is a rare condition which Vitamin D appears to exacerbate, apparently inhibiting the body/foreign cell differentiation, and the body attacks its own cells. This does NOT mean that they will let us start using CFC-22 again. Besides, too many people are making too much money on the ‘Freon-22’ Black Market. Dollar signs. Dollar signs, everywhere. That’s the money line. The darkness faced by bright forces is extreme. Hmmm, last 60 years. Again, I haul out my Worst-blank (wildfires, tornadoes hurricanes floods, etc. )-in-over-60yrs model and note that the tornado graph is just starting to look like the beginning of the build up from the early 50s to the ensuing 30 year stormy period. 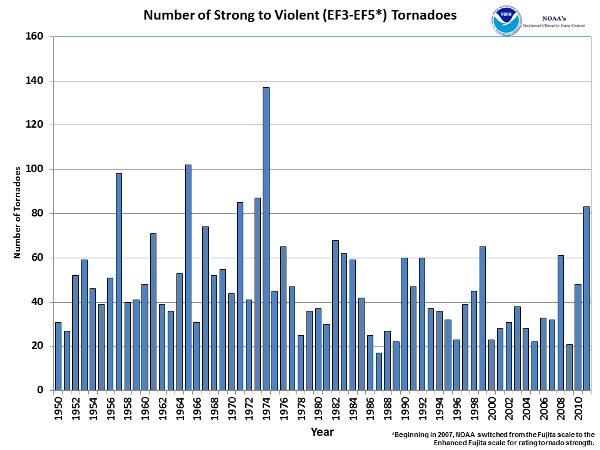 We should be careful here not expecting a build up of tornado activity for the next few decades. WHEN the increased incidence of stormy weather comes to pass, then there will be a lot of crowing by the climate change fellows. We should be advising that it is natural variation now and even predicting a stormy future for the first third of the present century. In 1986 Al Gore wrote in ‘Esrth in the Balance’ that increased UV light from the hole in the ozone layer was turning salmon and rabbits blind (as in loss of sight) in Patagonia. This appears to be remakably presecient, as there were virtually no instuments monitoring incoming UV in those days. First, please don’t misconstrue what I’m about to say…. I doubt any one here has a problem with funding research. Heck I have done research. But we do have a problem with agenda driven pseudo-research. Actually I feel rather sorry for the poor guys who have to kiss rumps to get funding and put the CAGW get out of jail free card on their research to get it peer reviewed. Bias does not belong in research. Unfortunately we see it all the time and it is getting worse. Someone named the newest version Hansenkoism which I feel is quite appropriate. Argentinian gummint vets stated there was a rash of UV-induced blindness in cattle being reported by ranchers after Uncle Al made that statement. The cows suddenly “got better” when the ranchers were told the cattle would have to be euthanized and there was no program to compensate them for any losses. The hole in the ozone layer(in the south Atlantic) corresponded with a magnetic anomaly in the same spot. I’m no scientist, but I thought that was a pretty remarkable coincidence. I’ve never seen mention of this. I believe that the reason Mars has no atmosphere is that it’s molten core solidified, bringing an end to the magnetic field that shielded it from the sun. Maybe the earth’s magnetic field has a more direct relationship with these atmospheric events than does any human activity.